This spider cake is either the best or worst thing online today. You choose. 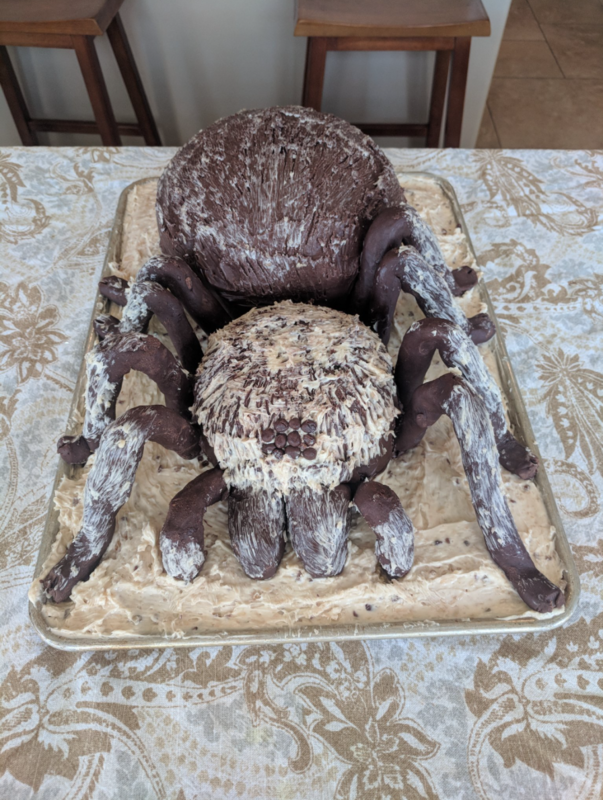 “Birthday party for my 8-year-old today and I was looking forward to posting some hilarious nailed it pictures of our tarantula cake,” Dusti posted referring to the Netflix cake fail-themed series Nailed It. “Modeling chocolate for the legs. Glass Pyrex bowls for the body parts,” wise spider cake craftsperson Dusti advised earnestly, in response. Some people thought they had been kicking goals in the birthday cake stakes … until Dusti showed up. “I actually lucked out and had two Pyrex glass bowls I was able to bake in!” oh great sharer of spider secrets Dusti revealed. “Awesome!!! What is underneath the tarantula? Cookie dough?” someone else wondered proving that everyone wants to know how you make a giant spider. “Actually, it’s a yellow sheet cake with buttercream frosting (mixed with walnuts and coconut)” Dusti confided. “Too impressive to eat?” one fan offered, gingerly. “I think I shed a little tear as I cut into it,” Dusti confirmed, obviously relieved to be “seen” and understood. While spider-cake-spider-cake-does-whatever-a-spider-cake-can had a LOT of fans, not everyone was completely sold. In fact, it’s true that some people were not sure how to reconcile the shaggy spider that had just turned up in their Twitter feed. “I’m having a love/hate relationship with these pics right now!” one posted. “Scary for me,” someone else wrote doubtfully. Supreme spider cake artisan Dusti coached them through their difficult time. “I offered rainbow cupcakes as an alternative for the wimps,” she soothed proving she’s both jaw-dropping arachnagenius and heart-of-gold host.